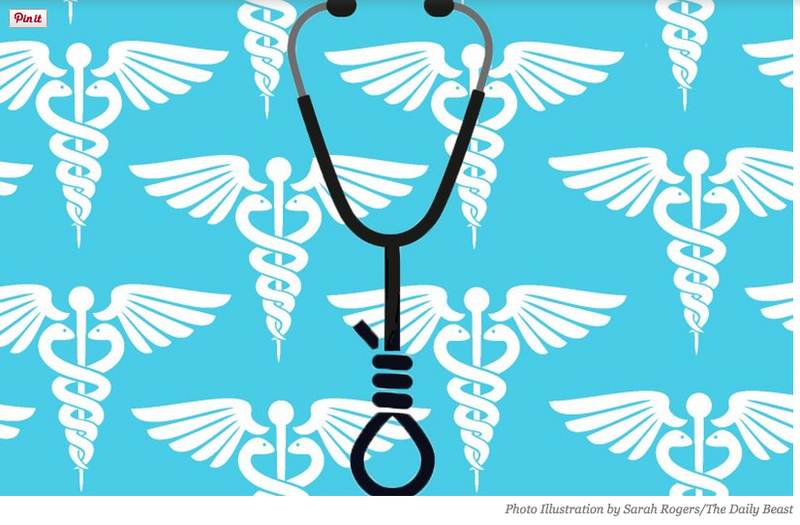 Experts discuss the coverup of doctor suicides, the reasons behind depression in doctors, and why doctors who are depressed are less likely than normal to get help. Physician Suicide and Physician Wellness Programs: We Really Need to Start Talking About the Elephant in the Room. Although no reliable statistics exist, anecdotal reports suggest an alarming upsurge in physician suicide. This necessitates a reappraisal of known predisposing risk factors such as substance abuse and depression but also requires a critical examination of what external forces or vulnerabilities might be unique to doctors and how they might be involved in the descent from suicidal ideation to suicidal planning to completed suicide. Perhaps it is how physicians are treated differently when they develop a substance abuse or mental health problem. Physician Health Programs (PHP) can be considered an equivalent to Employee Assistance Programs (EAPs) for other occupations. PHPs meet with, assess and monitor doctors who have been referred to them for substance use or other mental or behavioral health problems. Originally developed as “impaired physician” programs, the PHPs were created to help doctors who developed problems with substance abuse or addiction an alternative to disciplinary action by State Medical Boards. These programs existed in almost every state by 1980. Often staffed by volunteer physicians and funded State Medical Societies, these programs served the dual purpose of helping sick colleagues and protecting the public. Preferring rehabilitation to probation or license revocation so long as the public was protected from imminent danger, most medical boards accepted the concept with support and referrals. Most EAPs were developed with the collaboration of workers unions or some other group supporting the rights and interests of the workers. As there is no such organization representing doctors, PHPs developed in the absence of regulation or oversight. As a consequence there is no meaningful accountability. Noting that “for most physicians, participation in a PHP evaluation is coercive, and once a PHP recommends monitoring, physicians have little choice but to cooperate with any and all recommendations if they wish to continue practicing medicine,” Knight and Boyd raise serious ethical and managerial questions about current PHP policies and practice including conflicts of interest in referrals for evaluation and treatment, lack of adherence to standards of care for forensic testing of substances of abuse, violations of ethical guidelines in PHP research, and conflicts of interest with state licensing boards. As with Knight and Boyd’s paper outlining the ethical and managerial problems in PHPs, the NC PHP audit finding that abuse could occur and not be detected generated little interest from either the medical community or the media. Although state PHPs present themselves as confidential caring programs of benevolence they are essentially monitoring programs for physicians who can be referred to them for issues such as being behind on chart notes. If the PHP feels a doctor is in need of PHP “services” they must then abide by any and all demands of the PHP or be reported to their medical board under threat of loss of licensure. As with LDTs, the state PHPs are unregulated, and without oversight. State medical societies and departments of health have no control over state PHPs. Their opacity is bolstered by peer-review immunity, HIPPA, HCQIA, and confidentiality agreements. The monitored physician is forced to abide by any and all demands of the PHP no matter how unreasonable-all under the coloration of medical utility and without any evidentiary standard or right to appeal. State PHPs are non-profit non-governmental organizations and have been granted quasi-governmental immunity by most State legislatures from legal liability. By infiltrating “impaired physician” programs they have established themselves in almost every state by joining, gaining power, and removing dissenters. Groupthink and 12-step indoctrination are the goals. By advertising as advocates for doctors who are “caring,” “confidential resources,” “giving help,” and advocating for “colleagues in need” the outward appearance is one of benevolence. The biggest obstacle is that this system allows them to throw the normal rules of conduct under the imperative of a higher goal assumed to trump all other consideration. Those outside of programs either defend or ignore the reports of ethical and criminal violations, complacent in their trust of these “experts” claiming they are just helping sick doctors and protecting the public. With no oversight or regulatory body involved this is all done with impunity, immunity, and undercover. They use the accusation of substance abuse as an indication to disregard the claims of the accused. 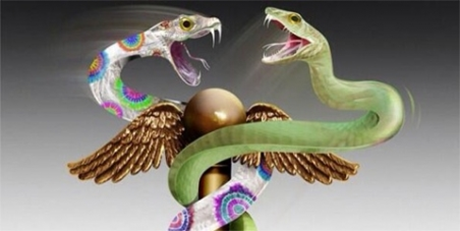 The physician is left without rights, depersonalized, and dehumanized. The imposition of confinement, stigmatization, lack of oversight of the organizations, peer-review protected confidentiality, and lack of procedural protection is a one-way train to hopelessness and despair. 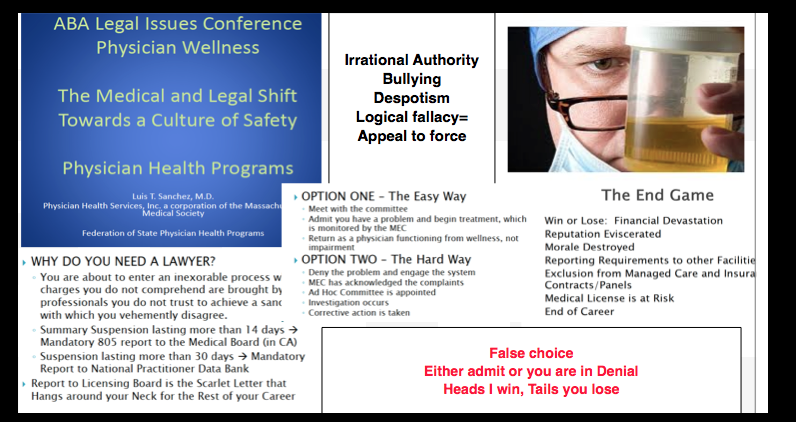 By establishing a system that of coercion, control, secrecy, and misinformation, the FSPHP is claiming an “80% success rate” 15and deeming the “PHP-blueprint” as “the new paradigm in addiction medicine treatment. The ASAM/FSPHP had a major influence on the DSM-V where drug abuse and dependence are no longer separate entities. They are also working behind the scenes to get legislation to randomly drug test all physicians. They are now after the “disruptive physician” and the evidentiary criteria are fairly low and red flags include “deviating from workplace norm in dress or conduct” and being tardy for meetings. Heightened perceptions of defeat and entrapment are known to be powerful contributors to suicide.23,24 The “Cry of Pain” model 25,26 specifies that people are particularly prone to suicide when life experiences are interpreted as signaling defeat which is defined as a sense of “failed struggle” or loss of social position and resources.. The person is unable to identify an escape from or resolution to a defeating situation, a sense of entrapment proliferates with the perception of no way out, and this provides the central impetus for ending ones life. 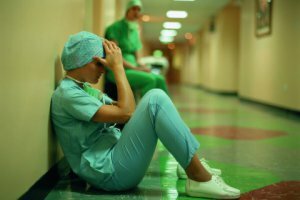 A recent report indicates that job stress, coupled with inadequate treatment for mental illness may play a role in physician suicide..
Physicians were 3.12 times more likely to have a job problem as a contributing factor. In addition, toxicology testing showed low rates of medication treatment. The authors concluded that inadequate treatment and increased problems related to job stress are potentially modifiable risk factors to reduce suicidal death among physicians. I can think of nothing more institutionally unjust than an unregulated zero-tolerance monitoring program with no oversight using unregulated drug and alcohol testing of unknown validity. 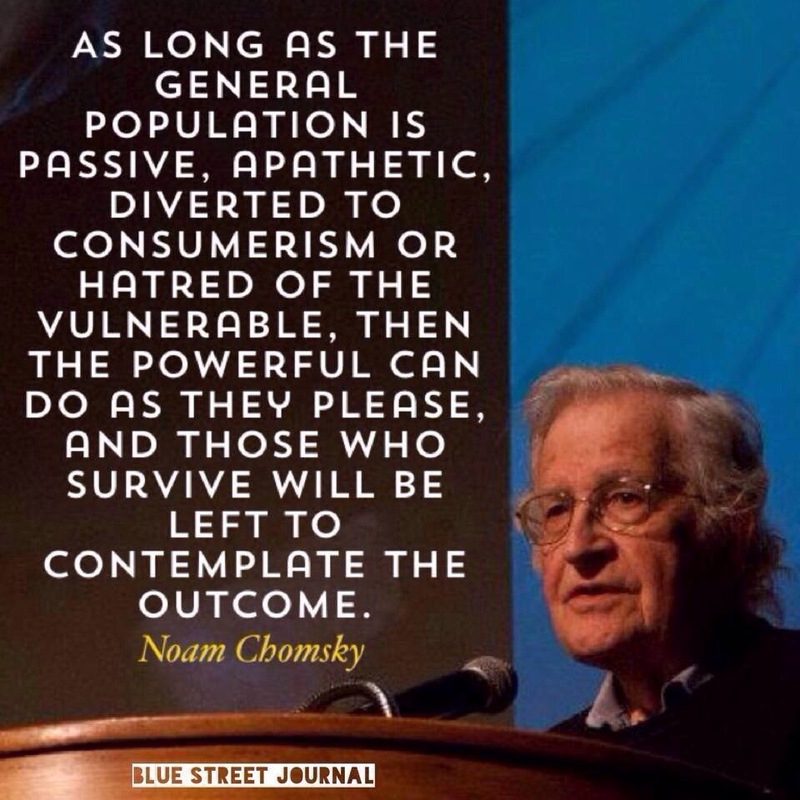 We have heard of numerous suicides due to these institutionally unjust programs. Three doctors died by suicide in Oklahoma in a one month period alone (August 2014). All three were being monitored by the Oklahoma PHP. I went to an all boys high-school of less than 350 students yet a classmate a couple years ahead of me died by suicide a few months ago. He was being monitored by the Washington PHP. His crime? A DUI in 2009–a one-off situational mistake that in all likelihood would never have recurred. But as is often the case with those ensnared by state PHPs he was forced to have a “re-assessment” as his five-year monitoring contract was coming to an end. These re-assessments are often precipitated by a positive Laboratory Developed Test (LDT) and state medical boards mandate these assessments can only be done at an out-of-state “PHP-approved” facility. Told he could no longer operate and was unsafe to practice medicine by the PHP and assessment center he then hanged himself. And at the conclusion of Dr. Pamela Wible’s haunting video below are listed just the known suicides of doctors; many were being monitored by their state PHPs–including the first name on the list– Dr. Gregory Miday. None of these deaths were investigated. None were covered in the mainstream media. These are red flags that need to be acknowledged and addressed! This anecdotal evidence suggests the oft-used estimate of 400 suicides per year (an entire medical school class) is a vast underestimation of reality—extrapolating just the five deaths above to the entire population of US doctors suggests we are losing at least an entire medical school per year. As physicians we need to demand transparency, oversight, regulation and auditing by outside groups. This is a public health emergency. They first came after the substance abusers and I did not speak out because I was not a substance abuser. They then came for those with psychiatric diagnoses and I did not speak out because I was not diagnosed with a psychiatric disorder. They then came after the “disruptive physician” and I did not speak out because I was not disruptive. They then came after the aging physician and I did not speak out because I was young. They then came after me and there was no one else to speak out for me. Ford DE, Mead LA, Chang PP, Cooper-Patrick L, Wang NY, Klag MJ. Depression is a risk factor for coronary artery disease in men: the precursors study. Archives of internal medicine. Jul 13 1998;158(13):1422-1426. Frank E, Dingle AD. Self-reported depression and suicide attempts among U.S. women physicians. The American journal of psychiatry. Dec 1999;156(12):1887-1894. Brewster JM. Prevalence of alcohol and other drug problems among physicians. JAMA : the journal of the American Medical Association. Apr 11 1986;255(14):1913-1920. Anthony J, Eaton W, Mandell W, al. e. Psychoactive Drug Dependence and abuse: More Common in Some Occupations than in Others? Journal of Employee Assistance Res.1992;1:148-186. Stinson F, DeBakely S, Steffens R. Prevalence of DSM-III-R Alcohol abuse and/or dependence among selected occupations. Alchohol Health Research World. 1992;16:165-172. Hughes PH, Brandenburg N, Baldwin DC, Jr., et al. Prevalence of substance use among US physicians. JAMA : the journal of the American Medical Association. May 6 1992;267(17):2333-2339. Kessler RC, Berglund P, Demler O, Jin R, Merikangas KR, Walters EE. Lifetime prevalence and age-of-onset distributions of DSM-IV disorders in the National Comorbidity Survey Replication. 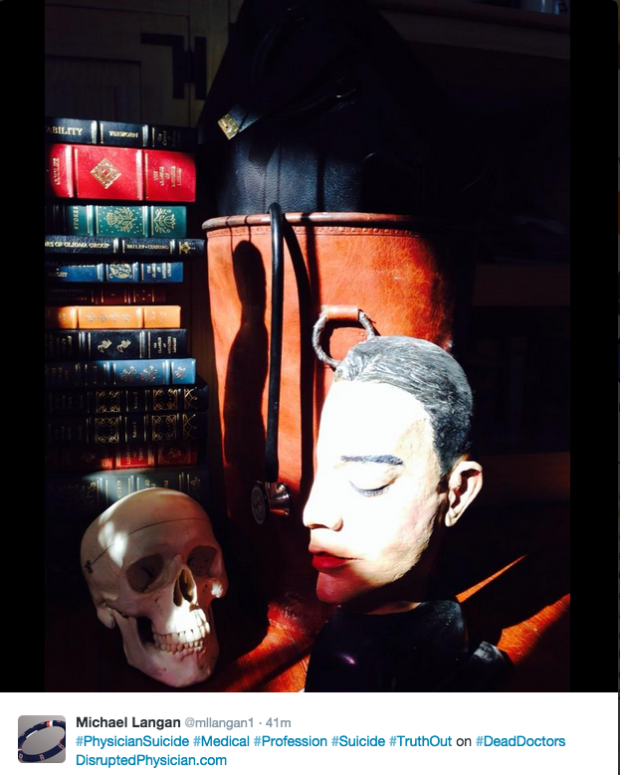 Archives of general psychiatry. Jun 2005;62(6):593-602. Boyd JW, Knight JR. Ethical and managerial considerations regarding state physician health programs. Journal of addiction medicine. Dec 2012;6(4):243-246. DuPont RL, McLellan AT, White WL, Merlo LJ, Gold MS. Setting the standard for recovery: Physicians’ Health Programs. Journal of Medical Regulation. Mar 2010;95(4):10-25. Skipper GE, Weinmann W, Thierauf A, et al. Ethyl glucuronide: a biomarker to identify alcohol use by health professionals recovering from substance use disorders. Alcohol and alcoholism.Sep-Oct 2004;39(5):445-449. Skipper GE, Thon N, Dupont RL, Baxter L, Wurst FM. Phosphatidylethanol: the potential role in further evaluating low positive urinary ethyl glucuronide and ethyl sulfate results.Alcoholism, clinical and experimental research. Sep 2013;37(9):1582-1586. Skipper GE, Thon N, DuPont RL, Campbell MD, Weinmann W, Wurst FM. Cellular photo digital breathalyzer for monitoring alcohol use: a pilot study. European addiction research.2014;20(3):137-142. Sharfstein J. FDA Regulation of Laboratory-Developed Diagnostic Tests: Protect the Public, Advance the Science. JAMA : the journal of the American Medical Association. Jan 5 2015. Pham JC, Pronovost PJ, Skipper GE. Identification of physician impairment. JAMA : the journal of the American Medical Association. May 22 2013;309(20):2101-2102. McLellan AT, Skipper GS, Campbell M, DuPont RL. Five year outcomes in a cohort study of physicians treated for substance use disorders in the United States. Bmj. 2008;337:a2038. Rivers I, Noret N. Potential suicide ideation and its association with observing bullying at school. The Journal of adolescent health : official publication of the Society for Adolescent Medicine. Jul 2013;53(1 Suppl):S32-36. Lester D, Walker RL. Hopelessness, helplessness, and haplessness as predictors of suicidal ideation. Omega. 2007;55(4):321-324. Beck AT. Hopelessness as a predictor of eventual suicide. Annals of the New York Academy of Sciences. 1986;487:90-96. Hinduja S, Patchin JW. Bullying, cyberbullying, and suicide. Archives of suicide research : official journal of the International Academy for Suicide Research. 2010;14(3):206-221. Hertz MF, Donato I, Wright J. Bullying and suicide: a public health approach. The Journal of adolescent health : official publication of the Society for Adolescent Medicine. Jul 2013;53(1 Suppl):S1-3. Kim YS, Leventhal B. Bullying and suicide. A review. International journal of adolescent medicine and health. Apr-Jun 2008;20(2):133-154. Kiriakidis SP. Bullying and suicide attempts among adolescents kept in custody. Crisis.2008;29(4):216-218. Taylor PJ, Gooding P, Wood AM, Tarrier N. The role of defeat and entrapment in depression, anxiety, and suicide. Psychological bulletin. May 2011;137(3):391-420. Lester D. Defeat and entrapment as predictors of depression and suicidal ideation versus hopelessness and helplessness. Psychological reports. Oct 2012;111(2):498-501. Williams JMG. Cry of Pain. Harmondsworth: Penguin; 1997. Williams JMG, Crane C, Barnhofer T, Duggan DS. Psychology and suicidal behavior: elaborating the entrapment model. In: Hawton K, ed. Prevention and treatment of suicidal behavior: from science to practice. Oxford: Oxford University Press; 2005:71-89. Borowsky IW, Ireland M, Resnick MD. Adolescent suicide attempts: Risks and protectors.Pediatrics. 2001;107(485). Clum GA, Febbraro GAR. Stress, social support and problem-solving appraisal/skill: Prediction of suicide severity within a college sample. Journal of Psychopathology and Behavioral Assessment. 1994;16:37-46. Fridner A, Belkic K, Marini M, Minucci D, Pavan L, Schenck-Gustafsson K. Survey on recent suicidal ideation among female university hospital physicians in Sweden and Italy (the HOUPE study): cross-sectional associations with work stressors. Gender medicine. Apr 2009;6(1):314-328. Fridner A, Belkic K, Minucci D, et al. Work environment and recent suicidal thoughts among male university hospital physicians in Sweden and Italy: the health and organization among university hospital physicians in Europe (HOUPE) study. Gender medicine. Aug 2011;8(4):269-279. Lindfors PM, Meretoja OA, Toyry SM, Luukkonen RA, Elovainio MJ, Leino TJ. Job satisfaction, work ability and life satisfaction among Finnish anaesthesiologists. Acta anaesthesiologica Scandinavica. Aug 2007;51(7):815-822. Heponiemi T, Kuusio H, Sinervo T, Elovainio M. Job attitudes and well-being among public vs. private physicians: organizational justice and job control as mediators. European journal of public health. Aug 2011;21(4):520-525. Elovainio M, Kivimaki M, Vahtera J. Organizational justice: evidence of a new psychosocial predictor of health. Am J Public Health. Jan 2002;92(1):105-108. Lawson KJ, Noblet AJ, Rodwell JJ. Promoting employee wellbeing: the relevance of work characteristics and organizational justice. Health promotion international. Sep 2009;24(3):223-233. Hayashi T, Odagiri Y, Ohya Y, Tanaka K, Shimomitsu T. Organizational justice, willingness to work, and psychological distress: results from a private Japanese company. Journal of occupational and environmental medicine / American College of Occupational and Environmental Medicine. Feb 2011;53(2):174-181. Lang J, Bliese PD, Lang JW, Adler AB. Work gets unfair for the depressed: cross-lagged relations between organizational justice perceptions and depressive symptoms. The Journal of applied psychology. May 2011;96(3):602-618. “Doctors who acknowledge problems with substances or mental health are typically referred to a physicians health program, or PHP. These organizations evaluate, monitor, and treat physicians. Established initially in the 1970s, PHPs, which exist in almost every state, were intended to divert physicians suffering from alcohol or drug problems from censure from their state medical boards. PHPs are incorporated as nonprofits and have autonomy from the boards. But some PHPs breach confidentiality if they fear a doctor is a danger to the public. And some state medical boards also fund their PHPs. Since the boards hold the keys to licensure, many say this is a conflict of interest. There are growing concerns about whether PHPs have the right approach to the job. They typically send doctors to rehab programs rooted in the faith-and-abstinence principles of Alcoholics Anonymous. While AA’s 12 steps might work for some with alcohol-use disorders, critics say most PHP recommendations are ill suited for patients with mental health problems.